Please check our clan called WAITOKARIRO #22PJ2VYVG. We war back to back (wars are optional tho), we finished 2nd and 3rd in the previous CWL and we always max Clan Games. Do not hesitate to ask me any question. We are a Clan Games Clan w/War being optional. Need a Clan for Clan Games? 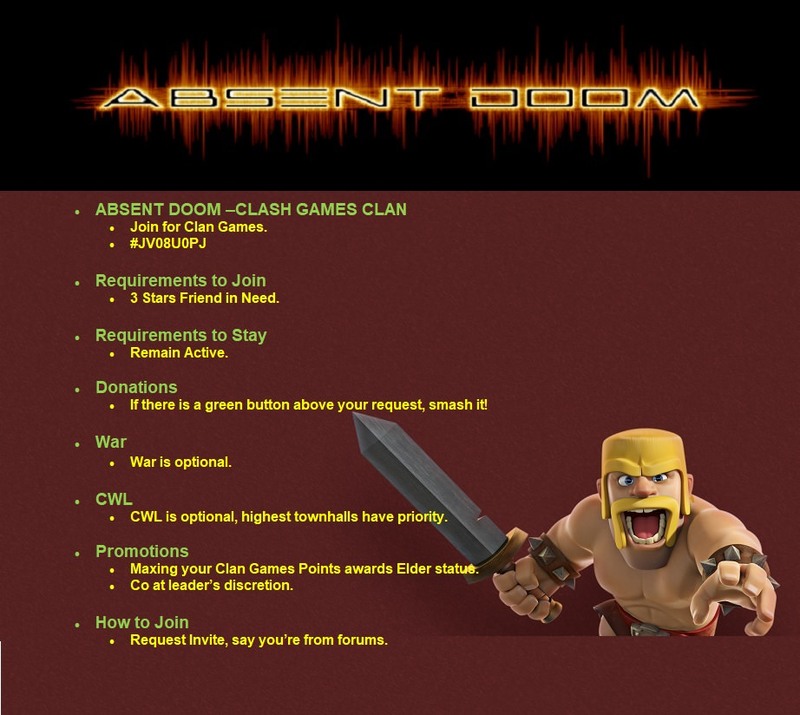 Join Absent Doom! Not sure if you are still looking, but if so feel free to check us out. We are a casual, adult only TH8-TH11 war clan. We only accept non-rushed and non-engineered bases. We are a laid back clan in general, but take war seriously. We are all 3 star minded in war (check our war log). We are happy to support developing new members by teaching them new war attack strategies and helping them practice to perfect the execution of war attacks.